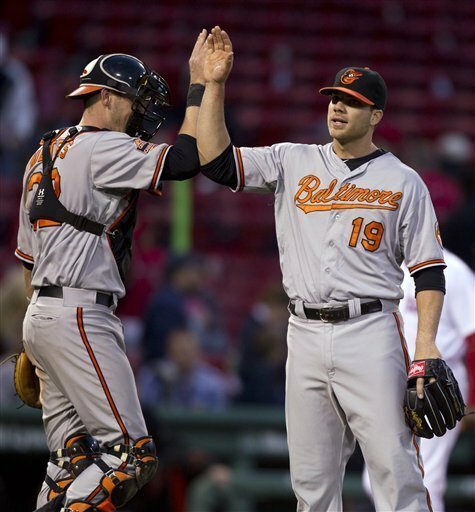 Buck Showalter’s tenacious Baltimore Orioles moved into first place in the American League East today when Orioles completed a sweep of Bobby Valentine’s reeling Boston Red Sox. The Orioles won 9-6 today in a 17 inning marathon that lasted 6 hours 17 minutes. The teams combined to use 18 pitchers who threw a combined 568 pitches. It was the second extra inning game of the series as the Orioles defeated the Sox 6-4 in a 13 inning game on Friday night and pummeled the Sox 8-2 on Saturday afternoon. Shortstop J.J. Hardy hit two home runs while Robert Andino also went yard for the second time in the series. Hardy was 5-8 with two homers and a double. Adam Jones hit the game winning home run in the 17th against Darnell McDonald, the Sox Left Fielder who had been called into the game in relief. Red Sox 3rd Baseman Will Middlebrooks hit a Grand Slam home run in the bottom of the 5th inning. The most remarkable thing about this game was Orioles Designated Hitter Chris Davis who was 0-8 at bat getting the win in relief. Davis who had last pitched in a community college game after having pitched in high schoolserved up two scoreless innings of relief to get the win. He had two strike outs a walk and gave up two hits but got the win. Darnell McDonald, the Outfielder called to pitch for the Sox in the 17th did not fare as well giving up 3 runs on 2 hits while walking two batters. Boston starter Clay Buchholz gave up 5 runs on 7 hits with 4 walks in just 3.2 innings of work. It was the fist time since 1968 that a position player won a game in relief in the American League although Phillies Infielder Wilson Valdez got a win in a 19 inning game on May 25th 2011 against the Cincinnati Reds. The game was also the first game where both teams used position players to close the game in relief since 1925. Then it was Hall of Famers Ty Cobb of the Detroit Tigers and George Sisler of the St Louis Browns did it in the second game of a double header on October 4th 1925. The Orioles are now 19-9 and 10 games over 500 since June 25th 2005. They are 11-5 on road and 10-5 vs AL East. There are still a lot of games left in the season and many including many O’s faithful don’t believe in the team. I think that they are a far better team, a deeper than than a lot of people give them credit to be. I think that they will break .500 this year if not do even better. With the Red Sox in disarray and the O’s playing the rest of the AL East tough I think that the Orioles will have a very respectable season. Their pitching staff, especially the bullpen is doing well and young players blooded by the brutal AL East are beginning to shine. Yes it is a long season and they play in what is arguably baseball’s toughest division but I expect them to surprise people this year. The Orioles begin a home stand at Camden Yards Monday hosting the very tough Texas Rangers followed by the always tough Tampa Bay Rays. The road trip was amazing but the Orioles need to be totally focused after the exhausting series against the Red Sox to win against these two very tough teams. In other interesting baseball news this week, Jared Weaver of the Angels pitched a no-hitter, Albert Pujols got his first home run of the year and Mariano Rivera of the Yankees was lost for the season due to a freak pre-game injury to his ACL and meniscus. Bryce Harper, the 19 year old wunderkind of the Nationals broke into the majors in a big way this week showing a prowess very unusual for a player his age. He has shown exceptional ability at bat, on the bases and in the outfield. Until tomorrow when I take on the topic of the sweeping changes brought about by the European elections and their possible effect on us over here on this side of the pond.